"Sampath Speaking" - the thoughts of an Insurer from Thiruvallikkeni: what makes a great Coach ? ~ Mike Hesson retires !! what makes a great Coach ? ~ Mike Hesson retires !! Do you know what connects Indian Cricketers – Bishan Bedi, Abbas Ali Baig, Ajit Wadekar, Sandeep Paril, Madanlal, Anshuman Gaekwad & , Kapil Dev – in the same order ? Read about a man - Angelo Dundee born in Philadelphia- being the man in the corner helping Muhammad Ali, Sugar Ray Leonard and George Foreman on their paths to greatness. His most famous moment came with Leonard, when he shouted "You're blowing it son! You're blowing it!" at his man at the end of his 13th round against Thomas Hearns. Leonard picked himself up and flattened Hearns in the very next round. At a time when WI batsmen used to demolish opposition bowlers, the little Gus Logie rotated the strike – he played 52 tests before he started coaching West Indies youth and A teams – he was with Canada, when they reached the group stage in 2003 and coached West Indies for a little over a year, severing links immediately after winning the Champions Trophy in 2004. Logie performed wonders to ensure Bermuda's qualification for the World Cup too ! So there could be unending debate on who makes a great coach and whether a coach can really transform an ordinary team to greater heights ~ remember when Kapil Dev lifted the Prudential World Cup in 1983, the only official was manager Mr Mansingh who perhaps took care of administrative matters. This post is on a man who changed the fortunes of New Zealand Cricket and has suddenly announced his retirement. Consider this – before the 2015 WC, Kiwis have made to the semis of WC 6 times, but never got into the finals. In 2015 in front of their home crowds, they were on a roll, marching to the finals unbeaten, but failed against their trans-Tasman rivals. Mike Hesson !! Back home, Captain Virat Kohli will receive the BCCI's Polly Umrigar award - honouring the best international cricketer - for the fifth time in his career following his consistent performance over the past two seasons. Also, for the first time ever, the BCCI will recognise the top international women players of the year, at their awards function on June 12 in Bengaluru. Harmanpreet Kaur wins it for 2016-17 and Smriti Mandhana for 2017-18. 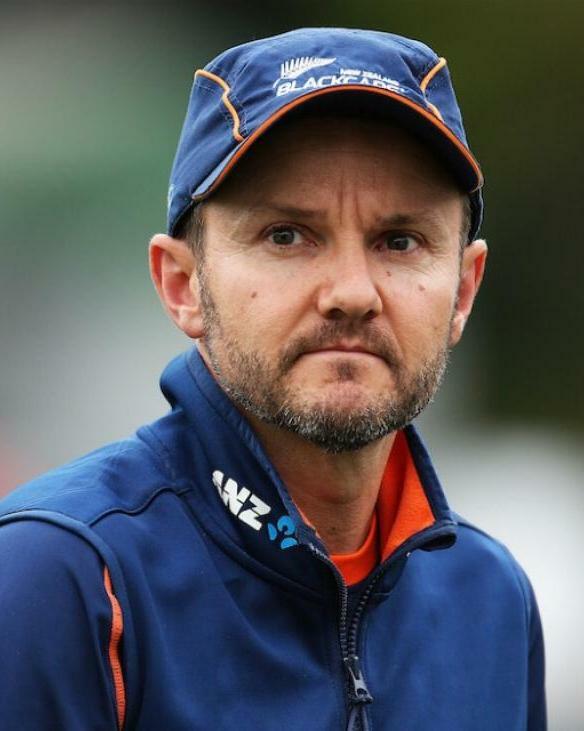 Downunder, with less than a year left to the World Cup, Mike Hesson, the 43-year-old head coach of New Zealand, has announced he will step down. Hesson made the announcement at a press conference on Thursday afternoon in Auckland. A New Zealand Cricket media release stated that he wanted "a break from the rigours of international cricket, and to spend more time with his wife and children." "There's so many other leaders in the playing group and in the support staff," captain Kane Williamson said. "I think we can't underestimate that. Hess was a big part of the environment but a lot of that was including others, giving others responsibility, and they've taken that responsibility on for a number of years and offered so much to that environment. "Him and Brendon [McCullum] were huge in that, and that's certainly been a strength of Hess' and we want to continue that moving forward. There are number of parts where that was shown. Certainly the backing of players for long periods, where guys could actually come into the environment and not feel like one day they're here and the next day they're there. [They said] actually, no, there's an investment from everyone here and you're good enough and you're backed and cricket has good days and bad days and it doesn't matter who you are." Hesson is set to leave in July, one year ahead of when his contract would have expired. NZC chief executive David White said he attempted to persuade him to stay on and guide the team through the World Cup in May 2019 but understood the decision. When John Wright quit as New Zealand coach in 2012, Hesson became one of the few full-time coaches of a Test nation not to have played a single first-class match. "There's a preconception that it helps to have played to coach - that has some advantages, but it's not completely necessary. If you haven't played you need to be able to look, learn, watch and absorb - Mike's got those qualities," his predecessor Wright reflected. To the Q at the start – the list of Indian Cricketers who became coach of the National Cricket team, before India looked out for foreign coaches ! !